The Blue Jays opened the season with a 6-1 win at Yankee Stadium two days ago, but I think they’re in for a loss tonight as they’ll take the field once again for the second game of this three game set after a day off Tuesday. 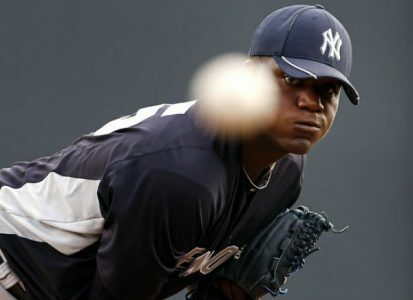 The Yankees will hand the ball to 26 year old Michael Pineda who was 5-5 behind a minuscule ERA of 1.89 last season. He’s looked equally sharp in spring training, going 2-0 with a 1.42 ERA while surrendering only one walk over 19 innings of work. He took the loss in both of his starts against the Jays last season despite conceding only three runs on 12 hits over 12 innings, striking out eight batters. Pineda is likely to get more run support tonight as Alex Rodriguez is back in the line-up after a year-long drug suspension, and Rodriguez is a mighty 7-for-22 against R.A. Dickey who will toe the slab for the visitors. Dickey was 6-9 with a 3.68 ERA over 17 outings away from home last year and surrendered six runs on five hits over five innings of work in his first start of the 2014 season. The Blue Jays are 0-3 when Dickey starts at Yankee Stadium, and I think we’re getting a fair price on the Yankees.